Getting stuck in PCS limbo can be frustrating! You know you are a ‘mover’ this year, but that’s all you know. And to make matters worse, everyone around you has their orders. They are already making plans to move. House hunts have started. The search for good schools is on and here you sit. But no need to twiddle your thumbs. There are some steps you can take to prep for the move even if you have no idea where in the world your next duty station will be. Yes, the military provides people to pack your stuff. But you can get started on your most precious items. One of the first things I pack up is my holiday decorations right after the holidays. Packing ornaments for a move is different from just packing away your Christmas stash for a year. I individually wrap each ornament and then clearly label each box. Another area that I pack myself is my scrapbooks, photo albums, and all my scrapbooking supplies. These items are not used on a regular basis, and they are items that I prefer to pack myself. Look for other items that you don’t use all the time – collections, books, mementos – and pack and label in advance. I prepack my most valuable items and let the mover’s pack my packed boxes. Getting organized is often the key to a smooth PCS. I never created a binder, but I did have a notebook that served the same purpose. It included all of my “To Do” lists. A PCS Binder is a great place to store all the paperwork that goes with a PCS: your orders (when you get them), shipping documents, medical records, dental records, passports or other travel documents, and school records. When you finally get your orders, you can start compiling information about your new duty station in your PCS binder. You can check out potential on-base housing options, local neighborhoods, realtors, even moving companies at PCSgrades.com. Keeping all your info in one spot makes things a lot easier during a transition. You don’t need to know your next destination to start purging. An on-post or neighborhood wide garage sale is a great way to purge and make a little extra cash. Go through those boxes that weren’t unpacked during your last move. Donate outgrown clothes and toys that are no longer played with. With every PCS, there were things I knew I didn’t want to move, so I gave them away. It’s never too early to start that process. You don’t need orders to start documenting all your most valuable belongings. Start big with taking photos of all your furniture. Then break it down and take photos of your Grandmother’s china, your antique radio, or your prized sewing machine. You want a photo record of your most treasured possessions so that in the event something does get broken or stolen you have picture proof that you own it and what it looked like before the movers got their hands on it. Over your two or three years at this duty station, you probably had a list, even if it was just in your head, of all the things you’d like to experience at your current location. And chances are, you haven’t completed that list. Now is the time to tackle all those things that you have put off or didn’t make time to do. It’s never too late to make your Bucket List and then act on it! You probably won’t be stationed here again so take advantage. Even those not-so-favorite duty stations have a few ‘can’t-miss’ attractions or experiences. I know, your orders haven’t come yet, but that never stopped me from checking out those duty stations still on the list. I like to be prepared. So while my husband told me I was wasting my time, I didn’t see it that way. I checked them all out and made my lists and imagined life at each and every location. Then when I knew where we were actually moving to, I was ready. PCSgrades.com has info on schools, neighborhoods, what the installation has to offer, commute times…. just about everything you will want to know about your new location. 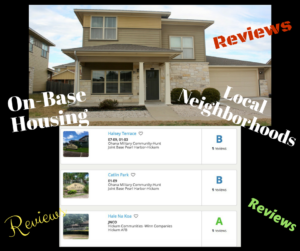 All the reviews are left by our fellow military and veteran families. PCSgrades also features Area Guides, Date Night articles, Bucket Lists, Out & About blogs and Day Trip info on many of the major military installations across the U.S.
Once we start the purging, organizing, and pre-packing in prep for a move, there is a tendency to check out from our current location. I’ve known spouses who stop going to Bunco or Book Club, stop volunteering in the classroom. There is a natural tendency to avoid new friendships. But this early step back, while psychologically might seem like a good thing, just prolongs that unsettled period of time where we feel like we don’t belong anywhere. It’s also not an option for our spouses or children. Our kids can’t mentally or physically check out of school without repercussions, and our spouses don’t want to risk getting stuck with a “short timer” label at work. Most of the mil-spouses I know, work or volunteer right up until the move. It helps to keep a sense of order to your life. And I’ve met some great mil-spouses in my last few months at a duty station, so I’m glad I didn’t close myself off to new friendships. Life doesn’t stop just because you are a mover. Prior commitments, school work, and community participation should all continue right up until the move. And while knowing where you will be moving to can give you a sense of control of sorts, it isn’t necessary to begin your prep. This military life isn’t always easy. The more you can do ahead of time, the better. Enjoy your last few months at your current duty station and use these tips and ideas to start your PCS prep. If you are anxious to do location research start at PCSgrades.com where you can get a great feel for a potential new duty station. And while you are at it, help your fellow military families by leaving a review of your current duty station. Military families helping each other out and paying it forward can be especially comforting when you are stuck not knowing exactly where you will end up.